Ruthenium was discovered in 1884 and is member of the platinum family. It is a rare metal and widely in electrical industry and in making alloys. Like other six members of the platinum-group, ruthenium has been known since pre-Columbian American time. It was used by European chemist in mid-16th to 18th century. Ruthenium was discovered by Karl Ernst Claus, a Russian scientist, in 1884 . The was a member of Russian Academy of Science and discovered the element at Kazan State University in Russia. 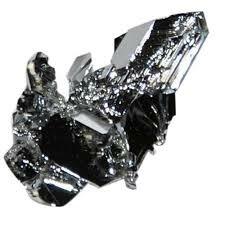 The element was named after the Latin name of Claus’s homeland, Ruthenia. Ruthenium is a rare metal. It is ranked as the seventy-fourth most abundant element and is present around 100 parts per trillion in the Earth’s crust. The elemental or free form of ruthenium is very rare. Mostly, ruthenium is present in minerals and ores, especially with platinum, in minute amounts. Each year around 12 tons of ruthenium are extracted and the estimated reserves of ruthenium in the world are about 5000 tons . Commercially, ruthenium is extracted as a by-product during the smelting process of ores of platinum, copper and nickel. The largest reservoirs of ruthenium are in South Africa, Canada and USA . Ruthenium is a whitish silver transition metal. It belongs to the platinum group of metals and in the 8th group of periodic table. Unlike the other members of the group that have two electrons in their outmost shell, ruthenium has only one valence electron. Ruthenium is resistant to tarnishing by air until exposed to high temperatures. Ruthenium is a fairly inert metal as it does not react with most of the elements of the periodic table. It is resistant to attack by acids; however, it dissolves in mixture of alkalis. Ruthenium also reacts with halogens at high temperatures. The most common oxidation states of ruthenium are +2, +3 and +4, however, the compounds of ruthenium can exist in a long range of oxidation state, -2 and from 0 to +8. Ruthenium is oxidized to form ruthenium oxide and is further oxidized to form ruthenium tetroxide, which is a volatile and strong oxidizing agent. Oxide of ruthenium resemble osmium tetroxide. With chalcogens, ruthenium forms dichalcogenides, which have properties of diamagnetic semiconductors. Ruthenium reacts with halogens, and forms ruthenium halides, such as ruthenium reacts with fluorine to form hexafluoride, pentafluoride and tetrafluoride and form ruthenium trichloride with chlorine. Ruthenium is most widely used in electronic industry. Ruthenium dioxide is used to make thick-film chip resistors. Ruthenium is widely used to make alloys with other metals. For example, it used to provide strength and increase the corrosion resistance of palladium and platinum. Ruthenium tetroxide is used as staining and fixing agent in electron microscopy of organic tissues and compounds. Ruthenium is widely used as catalyst in various industrial applications. Ruthenium is a non-toxic metal. It has not known biological role. However, various compounds of ruthenium, including ruthenium oxide, are quite toxic, and some are considered as poisonous and carcinogenic. Ruhtneium-106, is a radioactive isotope and has a long half-life. It was part of the nuclear testing program that started in second World War (1945) and ended in 1980s. Due to its stable nature, ruthenium can pose danger to human health for long time period, for decades and even centuries . There are seven isotopes in naturally occurring ruthenium. They are also the stable isotopes. There are thirty-four unstable or radioactive isotopes of ruthenium, among them the most stable isotope is ruthenium-106 that has a half-life of 373.59 days. Most of the isotopes undergo decay through electron capture and beta emission.
. Weeks, Mary Elvira (1932). “The discovery of the elements. VIII. The platinum metals”. Journal of Chemical Education. 9 (6): 1017. Bibcode:1932JChEd…9.1017W. doi:10.1021/ed009p1017.
. Emsley, J. (2003). “Ruthenium”. Nature’s Building Blocks: An A-Z Guide to the Elements. Oxford, England, UK: Oxford University Press. pp. 368–370. ISBN 978-0-19-850340-8.